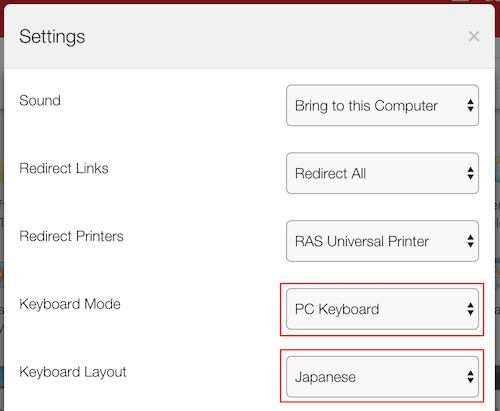 This article explains how to configure Japanese Input with various client devices connected to applications or desktops published by Remote Application Server. 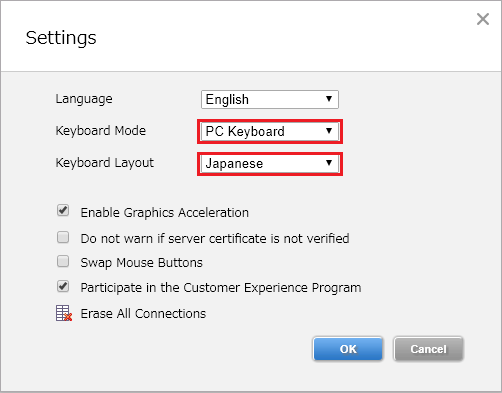 For the first step, it is recommended to confirm Japanese 106/109 keyboard driver is correctly installed in a Terminal Server or Remote PC where Parallels Client will connect. 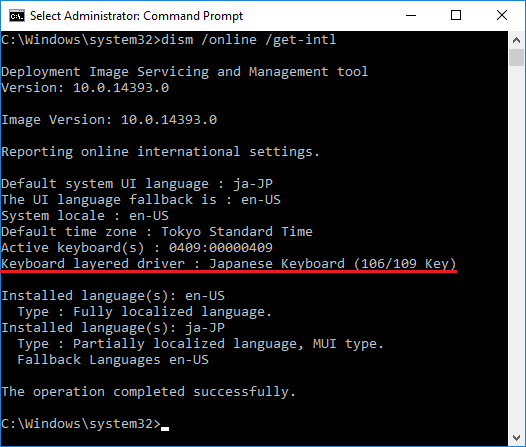 It will not be a problem when installing OS with using Japanese installation images, but in environments where Japanese language packs are applied based on English OS such as Microsoft Azure or Amazon EC2 instances, there is a possibility English 101/102 keyboard driver is installed. 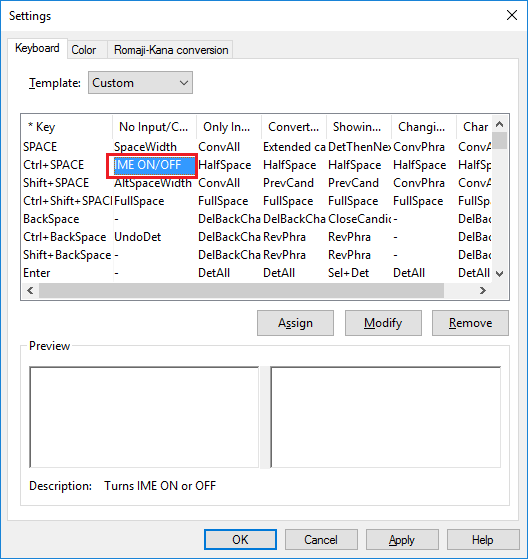 If Keyboard layered driver shows other than Japanese Keyboard (106/109 Key), change the registry keys according to this article then reboot the OS to load the Japanese keyboard driver. Execute dism /online /get-intl again to make sure Japanese keyboard driver is loaded correctly. When using IME Pad, Dictionary Tool or etc. in published applications, it is useful to float the language bar on the application session. 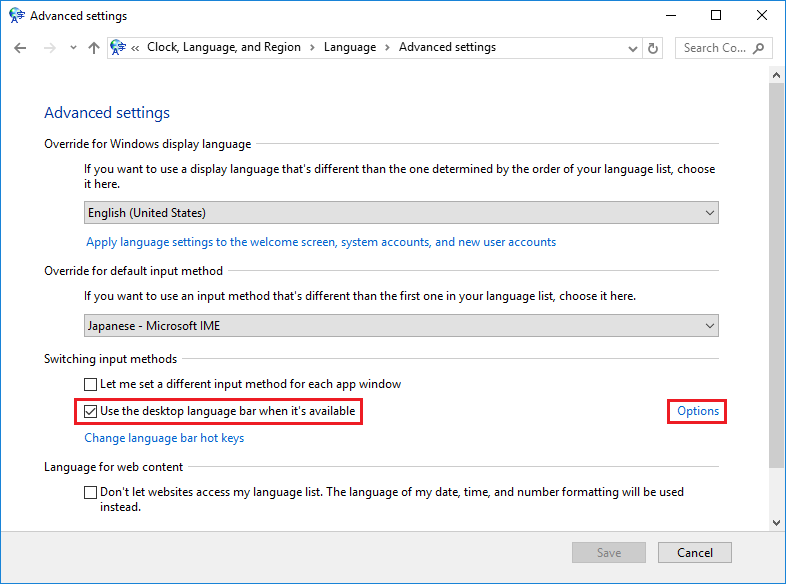 Navigate to Control Panel > Clock, Language, and Region > Language, choose [日本語 (Japanese)], then click Advanced settings. 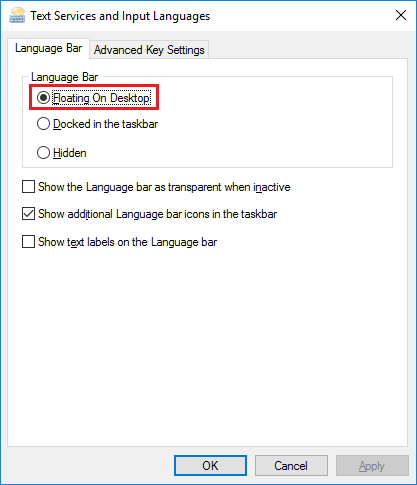 In Switching input methods section, enable Use the desktop language bar when it's available. Click Options, choose Floating On Desktop on Language Bar tab then click OK.
Other client devices than Windows (such as Mac or Chromebook) may not have the above keys. It is possible to switch IME by customizing the key setting on the Terminal Server or Remote PC side in advance. Navigate to Language bar > Tools > Properties > Advanced > Editing operation and behavior > Advanced then choose any key combinations. For example, double-click Ctrl + SPACE > No Input/Converted strings, choose IME ON/OFF then click Apply. With this setting, even with a keyboard which does not have [Half-width/Full-width] key, Ctrl + SPACE can be used to toggle IME. That's the setting on a Terminal server or Remote PC side. After that we will make settings on a client device side. To use Japanese Input in Parallels Client for Mac, use v15.5 Update 3 (build 16279) or later. Confirm the version by the following procedure. Launch Parallels Client, choose Parallels Client > About Parallels Client from the menu bar then confirm Version 15.5 (build 16279) or later. For older versions, upgrade to the latest version from Mac App Store. To switch IME in a published application or desktop connected from Parallels Client for Mac, press [Kana (かな)] key to turn IME on, or press [Alphanumeric (英数)] key to turn IME off. To use Japanese Input in Parallels Client for iOS, use v16.0 or later. For older versions, upgrade to the latest version from App Store. If you cannot switch input methods by Ctrl + Space keys with a Bluetooth keyboard, configure the following setting in iOS then switch them by Caps Lock key. Note: This issue has been resolved by Parallels Client for iOS v16.1 or later. In a client side, access HTML5 Gateway (https://gateway-hostname/RASHTML5Gateway) with a browser and log in. Click on User name > Settings then confirm the version displayed at the bottom left of the dialog is 15.5 (build 16138) or later. For older versions, in a server side, click RAS Admin Console> Administration> Software Update> Check Now and update to the latest version. Note: Upgrading RAS affects active users currently connecting to published resources, so we recommend planning to upgrade off-hours. For the upgrade procedure, refer to this article. If you'd like to use Microsoft Internet Explorer or Microsoft Edge for HTML5 Client, confirm the version of HTML5 Client is 16.0 Update1 (build 18458) or later. For older versions, Japanese Input works properly with Google Chrome or Mozilla Firefox only. Log in to HTML5 Gateway using a browser such as Google Chrome or Mozilla Firefox. Note: This setting needs to be done for each browser. For example, if a user accesses HTML5 Gateway with both Google Chrome and Mozilla Firefox, make the above settings in both browsers. To confirm the version of Chrome Client, click Gear icon at the upper right of the window, click About then make sure Version is 16.1.x or later. When floating a language bar as mentioned above, it can be used in the published application, but there was a limitation that a minimized language bar cannot be restored. To resolve this issue, upgrade RAS to v15.5 Update 2 (build 16138) or later. 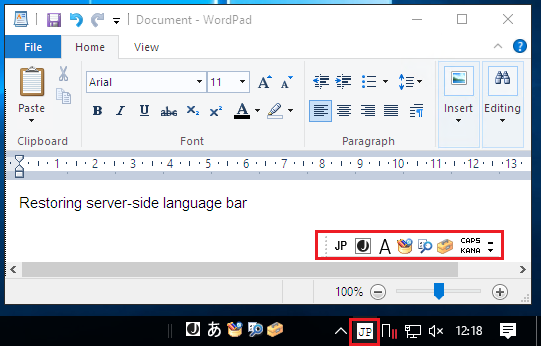 With v15.5 Update 2 or later, a language indicator such as [JP] is displayed in the notification area of Parallels Client, and you can restore server side language bar by clicking it. Parallels Client for Windows, Mac and HTML5 Client are the client platforms that support restoring the language bar. Right-click a Terminal Server, click Properties > Agent Setting tab. Uncheck User RemoteApps if available. If Inherit default settings is checked, click Edit Defaults, uncheck User RemoteApps if available in [Agent Settings] tab.